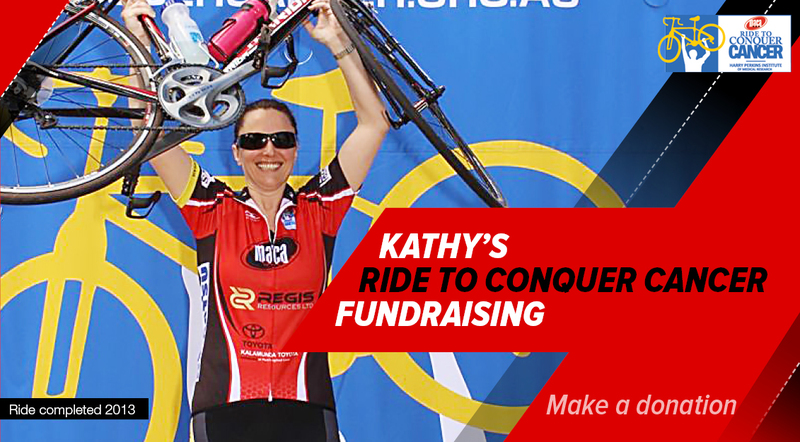 Accountancy Group’s CEO, Kathy Karasavidis, is participating in the Ride to Conquer Cancer – a bike ride on 17-18 October 2015 spanning 2 days and over 200 kilometres. A fitness and cycling enthusiast, Kathy’s challenge is to prepare herself physically and mentally for this challenging event, with the ultimate goal of raising $5,000 in donations. The fundraising efforts will benefit Harry Perkins Institute of Medical Research. Ready to do it all over again, she has prepared an intense training program, which includes weekend bike rides with her husband and three young boys. Director of Accountancy Group, Manuel Tsirmiris, is proud to support her as a training partner, ensuring her training goals are met and surpassed. Her goals this year is to beat both her 2013 fundraising goal and personal best ride time. The director and staff at Accountancy Group will dig deep for donations, as well as provide personal support for Kathy’s challenge. We ask you to join in our support for this great cause by donating via her RTCC page and following her journey on our social accounts below. For all corporate donations received, please email us your company logo for mention on our website honour roll, we will be proud to support you and your business. Remember, all donations are tax deductible!